We offer generously sized one- and two-bedroom apartments with complete kitchens, including a stove, refrigerator, and microwave. Each apartment comes complete with neutral wall-to-wall carpeting, walk-in closets and individual heating and cooling units. 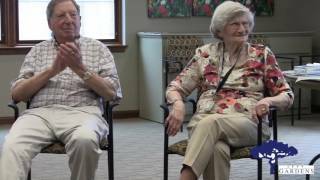 Click on the video to learn more about Levy Gardens. Call Sara Miller at 330.746.3570, ext. 371 to schedule a tour. Levy Gardens Assisted Living tenants and staff wore blue March 8 to show their support for General Motors employees. True Blue Friday was coordinated by the Drive It Home campaign that is bringing the community together to urge General Motors to support growing their investment at the Lordstown Complex.